Posted May 1, 2015 by Rob Smedley & filed under Soundtracks. What would the Star Wars franchise be without John Williams? 83 years young, and he’s still the musical Force of the Star Wars cinematic process, surrounding and binding together the galaxy of acting, dialogue, effects both practical and special, in a grand orchestral sound inspired by Erich Korngold and the Golden Age of adventure cinema; a style oft-imitated by composers but never bettered. Even amid the nostalgia overload of the latest The Force Awakens trailer, hearing ‘The Force Theme’ as those X-Wings roar across a lake (actually Blighty’s own Derwent Water, fact fans) creates the same tingly ‘Oh my god I’m a kid again!’ sensation as the sight of a crashed Star Destroyer or a 72 year old nerf-herder saying ‘Chewie…we’re home,’ does. So this May the 4th, celebrate the highlights of his ‘long time ago far far away’ legacy with Music from the Star Wars Saga, a 15 track ‘Best of’ compilation of music drawn from the first six Star Wars films, and performed by the ever-reliable Prague Philharmonic. And, barring the notable omission of ‘The Force Theme’, this is a top selection; genuinely the cream of Williams’ work on the franchise, including his best pieces from the prequels. No matter how overbearing your opinion on them, a listen to this album may remind those disillusioned by Episode I, II and III to at least appreciate music that was otherwise drowned out by snark and criticism of George Lucas. So here’s a chance to enjoy the unfairly forgotten ‘Across the Stars’ from Attack of the Clones; a space-age Romeo & Juliet epic that manages to convey doomed intimacy set against the tumultuous backdrop of a sweeping galactic conflict. It’s William’s overlooked Star Wars masterpiece, on par with Episode III‘s terrific swashbuckling choral epic ‘Battle of the Heroes’, which is also present. Even if you are familiar with Williams’ work down to the last quaver it’s still interesting to hear the slight variations and tiny different instrumental emphases that a different conductor and orchestra bring. The Prague Phil.’s ‘Duel of the Fates’ lacks the choral strength of numbers but compensates by featuring some noticeably pronounced percussion compared to the London Symphony Orchestra’s original. It adds an interesting new bite and fury that evokes the clash of lightsaber on lightsaber on super-awesome double-edged lightsaber. 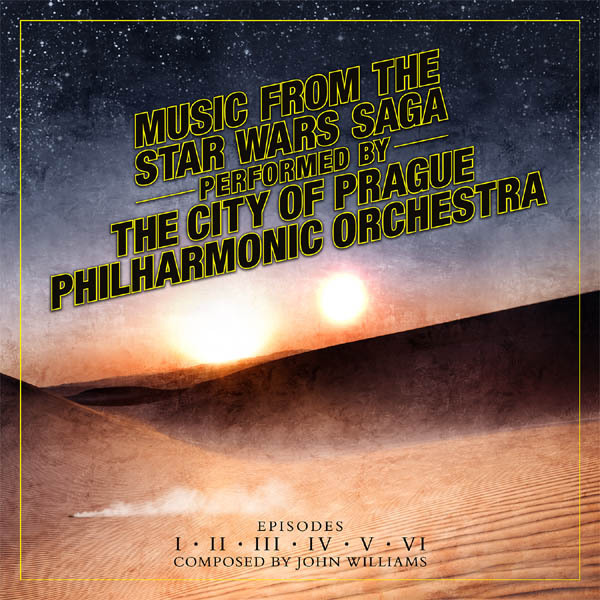 The Prague Philharmonic are on top form here, with particularly impressive performances of the Main Theme (vitally important to get that right) and ‘Anakin’s Theme’, as well as a jolly rendition of the ‘Cantina Band’ tune that would give Figrin D’an and The Modal Nodes a run for their credits. If you don’t already own the original soundtracks, or if you’re just starting to explore John Williams’ perfect sci-fi soundscape and want to hear the best of his work before his next outer space opus (he’s currently scoring Episode VII, this time with the LA Philharmonic), this is the album to do it. Stick it in your music player of choice and queue it up. You know what to do next, right? Punch it, Chewie! Released on Monday 4 May 2015 by Silva Screen Records.